I awoke this morning needing a gentle start to the day. The after-party following my choir concert last night had been raucous and I was feeling somewhat fragile. I had been planning to read Emma’s War next, but couldn’t quite face a book based on a real war story. I also thought it wasn’t worth reading anything that would require any sort of mental effort, or which might actually be beautifully written, as I may not get the most out of it. So, I consulted E to see whether any of her books could be classified as Brainless Reads. 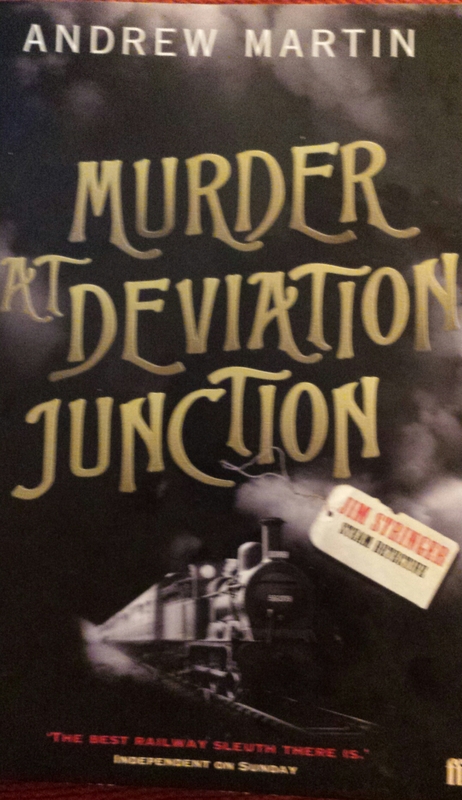 She thought for a while and then came up with Murder at Deviation Junction. She even suggested that once I had read it, we could get rid of it. Sacrilege! I have to say that I think her assessment was right though. This isn’t a brilliant book. It is set in the North of England in December 1909 and really ought to feature snow as part of the cast list. There is a lot of snow. At the start of the story a body is discovered (in the snow), and ‘struggling railway detective’, Jim Stringer, just happens to be there (in the snow) by sheer coincidence with another man who just happens to be embroiled in the murder plot – though this only become clear later. From here we follow Jim as he takes on the murder, in spite of the views of his senior officers, and travels the length of the country, through blizzard after blizzard, trying to work out whodunnit. About half-way through the book, I began hoping that there would be a monumental twist as the line of reasoning and investigation that Stringer was following seemed flimsy. There are a lot of coincidences and all of the clues appeared in a way that was just a bit too pat for me. I also didn’t believe that he would have made a lot of the decisions that he did make – haring off around the country and wotnot. It didn’t seem in keeping with his character. This book is the fourth in the series though, so maybe if I had read the previous three it would have felt more plausible. The story never really developed much tension, for me. As a thriller, it was distinctly lacking in thrill. There is also a lot of the murder plot that is explained to him by someone for no reason other than that they like explaining things, which feel like cheating. I like a murder mystery where I at least stand a chance of working it out for myself. The side story of whether he would get his promotion, to be able to better look after his sick child, didn’t really land well with me either – it seemed contrived. If you are very keen on trains then you may get more out of this book. There are lots of descriptions of trains and sidings and other railway paraphernalia. Stringer is described on the front cover as “the best railway sleuth there is”, but you can’t help thinking that it may not be that strong a field of contenders. One thing, that is interesting, is that the book contained an envelope addressed to E with a Spanish stamp dated June 2007. Apparently, it had contained a form of old-school spam – a letter informing E that she had just inherited a small fortune and that all she had to do to claim it was to send 500 Euros as a processing fee. Think how different life could be if she had only taken up this kind offer. All in all, I wouldn’t rush to pull this one off your shelves – unless you really are a steam railway enthusiast with time on your hands. Tags: books, murder, railways, reading, trains. Bookmark the permalink. Afraid so! I will have to hunt out the other ‘railway sleuths’ and see if I can find a better one! I’m sure the OXFAM shop would like it!